The financial crisis commission didn’t bother to talk to the housing bust’s victims. We did. After 18 months and more than 700 sworn testimonies, Congress’ Financial Crisis Inquiry Commission wrapped up its hearings last September with three unscheduled witnesses—a last-minute plea from a lawyer got them included, for five minutes each, at the tail end of the commission’s hearing in Sacramento. A relative helped 79-year-old Lovie Hollis to the microphone. She testified (pdf) that she and her husband Grafton had raised five daughters in their Sacramento home and had paid off their mortgage but had to sell in 2006 when Grafton could no longer get up the stairs. She did not understand the terms on their new home and was unable to pay when the monthly rate suddenly adjusted upward to nearly three times the original mortgage. She answered an ad offering loan modification help. “Tom” operated out of an office in Hollis’s neighborhood. He told her to stop making loan payments while he worked on her case, took her money (and her car), and fled. Hollis, now a widow, lost her home. Nia Lavulo, a young Fijian-American, was nervous speaking to a room full of suits. She testified (pdf) that she lost her childhood home when CitiMortgage, Inc. foreclosed without notice. She had signed an agreement with the bank for a trial period of modified loan payments after her partner, Bernard, was laid off. They’d been paying their modified loan on time and in full right up until they were foreclosed, but that didn’t seem to matter to Citi. The room grew quiet. Chairman Phil Angelides thanked everyone and quickly brought official business to a close. (The commission’s final report—now compromised by Republican members who released their own ‘preliminary findings‘ when Democratic members refused to excise the words “Wall Street,” “shadow banking,” “interconnected,” and “deregulation” from the document—is due to Congress and the president Thursday.) After hearings in 19 hard-hit cities across the nation, these three homeowners were the only actual victims of the mortgage meltdown to be heard. The Okies’ promised land has become a wasteland of vacant storefronts and bank-owned homes. The itinerants of Lange and Steinbeck’s day are today’s “chronically unstable.” But unlike their forebears, they have nowhere to go in search of work. The numbers are familiar by now. In normal times, banks foreclose on approximately 100,000 homes annually, but from January through September 2010, almost 2.7 million homeowners received foreclosure notices. September alone saw more than 100,000 bank repossessions. According to the Special Inspector General for the Troubled Asset Relief Program, “at that pace, foreclosure notices will have been sent to more than 3.5 million homes” by year end 2010. California has been hit with more foreclosures than any other state. The 19 counties in its Central Valley region all show up in a bruised-red hue on foreclosure trend-spotter RealtyTrac’s national foreclosure map—indicating high-density home loss. I wondered what was happening on the ground, to the people who had gone into default or had actually lost their homes. I was also struck by the fact that during the last massive economic crisis to hit this country, this very region was the place to get out of hock and despair. Back then, drought, farm failures, and foreclosures in the Plains forced hundreds of thousands to move west in search of work. Many of these Dust Bowl migrants followed the harvests in the fertile Central Valley—an odyssey captured by Dorothea Lange, working for the Farm Security Administration, in the 1930s. Today, when you travel Lange’s 1939 photographic route up Highway 99—as photographer Lucy Gray and I did for four months last spring—you come face to face with the 21st century version of social collapse: Kern County, home to the Weedpatch labor camp made famous in John Steinbeck’s The Grapes of Wrath, has an unemployment rate of 15.4 percent. In Tulare it’s 16.8 percent; and in Merced County, whose largest city, Stockton, was deemed by Forbes the second “most miserable city in the US,” nearly one in five [18.6 percent] can’t find work. The Okies’ promised land has become a wasteland of vacant storefronts and bank-owned homes. The itinerants of Lange and Steinbeck’s day are today’s “chronically unstable.” But unlike their forebears, they have nowhere to go in search of work. The foreclosure crisis has many causes, from impotent government programs to shadow banking, securitization, predatory lending, borrower overreach, and simple market correction. But the most persistent culprit has been a weak economy that has led to massive job losses and wage cuts. Many families could have survived an ARM in good times but were felled by a pink slip, reduced hours, or unforeseen medical bills. And, apparently, there’s no point in seeking help from Washington. Early in the 20th century, the Great Depression inflicted enough suffering and stirred up enough of a public outcry that legislation was passed to create a whole string of financial consumer-protection agencies: the Federal Deposit Insurance Corporation to protect individual savings; the Securities and Exchange Commission to regulate investments; the Federal Housing Administration to insure mortgages and home loans. Today, we can’t even get to a bipartisan report on what created the financial collapse, much less the political will to mitigate against a repeat performance. That no one has been listening, that there is no workable government program to turn to for relief, and that the banks continue to deny permanent loan modifications even after receiving taxpayer bailouts for that very purpose, has frustrated and angered many. 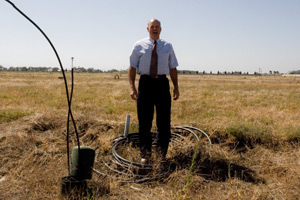 The Home Affordable Modification Program (HAMP)—the “socialist” program that set CNBC’s Rick Santelli off on the tear that launched the tea party—was very unpopular among those I talked to in the Central Valley, but for reasons far different than Santelli’s. 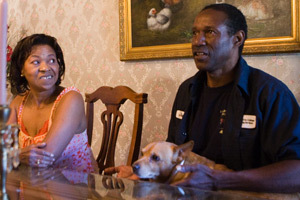 HAMP was supposed to help between three and four million Americans stay in their homes. The program received $75 billion aimed specifically at incentivizing mortgage companies to lower payments and renegotiate rates for at-risk homeowners. Yet according to the Treasury Department, less than one-third of all temporary modifications through HAMP are made permanent. Last summer, Sarah Palin passed through the Central Valley to speak at a private fund-raising event at the state university in Turlock. In opening remarks, she gave a shout out to family farmers, many of whom have been slammed by the decline in the price of Stanislaus County’s number-one commodity, milk, saying: “I have great respect for you [and the] business that you want to pass on, generation to generation.” In a 35-minute speech, Palin said “liberty” 18 times and “freedom” 17 times, with nearly as copious references to “threats” to both. But in a county where 1 out of every 99 homeowners has received a foreclosure notice, (the national average is 1 in 492 ), she offered not a peep about the quotidian threats of a mortgage collapse. In the months I traveled through California’s Central Valley, it was nearly impossible to meet anyone who hadn’t been affected by the foreclosure crisis. One morning I spoke with a HUD-certified mortgage counselor about her clients. 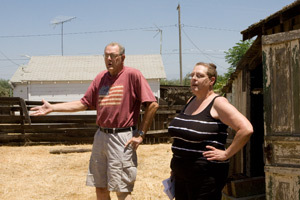 She volunteered that her own house in the agricultural town of Visalia was underwater because so many neighbors had been foreclosed and the value of her property had plummeted. She had no plans to walk away from her mortgage, she said. But she understood why many were making a rational economic decision to do just that. At Wool Growers, a Basque restaurant in Bakersfield that’s been serving pork dip and pink beans in massive family-style helpings for a half-century, our waitress said she was having trouble keeping up with her ARM. Her best friend had just lost her home. Others had gotten caught up in the romance of refinance, using the equity in their home as an ATM. “People actually came to our neighborhood and went door to door asking if folks wanted to fix up their house,” Fresno-area resident Sandra Crump told me. “Everybody jumped on it. Our neighbor down the street lost his house. The people behind us lost their house.” Once hailed as engines of a booming economy, the aspirants to the ownership society now struggled simply to keep a roof over their head. Gibson Avenue, Clovis, California. Sandra and Jared Crump. Billie Ray Atchely, Bakersfield, California. But where will California tenants go if they’re kicked off the land? Mary MacNeil and Michael Hurst, Strathmore, California. Mary: “My brother is handicapped and my main job is him and the house. We signed the paperwork with Wachovia and moved in December 2007. It was a 30-year fixed but in May 2009 our payment jumps up. I call the bank and speak to Yolanda. She tells me that happens when the insurance or taxes go up. Well, we had just gotten a notice from the county that our property taxes had gone down—the value of our home had decreased from $159,000 to $140,000—and we had just gotten a renewal on our insurance policies, which are tied in with our house payments, and they were the same. I tell her this.” Michael: “They hadn’t even sent notice that the payments were going up. The only way I knew is that they provide a payment booklet with the monthly fees and when I get the new one my mortgage has increased.” Mary: “Yolanda says, ‘Maybe you need to talk to your loan officer.’ I say, ‘I am talking to her! It’s you!’ I tell her we had a fixed mortgage. I ask if there’s any way she can look it up on the computer and explain what happened. And she says, ‘I can’t help you.’ So we send the increased payments to Wachovia. But in August we get a letter from Wells Fargo that they had taken over the loan and it was behind. It wasn’t behind. The increased payments had gone to Wachovia. The only thing we did differently was send July and August together because it took Michael is little while to pay that increased amount that month. Then in February 2010, we get a letter from some law firm representing Wells Fargo, saying they could restructure our loan. We filled out all the paperwork. We wrote exactly how much our bills are, how much Michael makes, all our personal information, our situation of how it got to where it was. Five weeks later we get a letter from this firm saying ‘we can’t help you.’ And in April, the bank taped a foreclosure notice to our gate.” A recent statewide survey of California mortgage counselors found that 60 percent of them had clients who suffered foreclosure while in the middle of negotiating with their servicer. 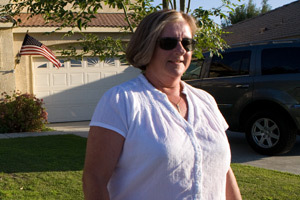 Jeannie Gaines, Bakersfield, California (with sons Matthew and US Navy, on leave), daughter-in-law Sheryl Gaines, and granddaughter Savannah, Bakersfield, California. “My son has cerebral palsy. I can’t really punch a clock because I have to go to all his therapies and appointments. About 18 years ago I started doing commission work with different companies to sell their jewelry, purses, and scarves to Longs Drugs. I’ve always worked hard. This is the first home I’ve owned since my divorce 15 years ago. It was appraised for $235,000 but I got it for $200,000. I can’t just move. My son is totally dependent on me and always will be. I’ve done a lot of modifications so he can get around in his wheelchair. When Longs was bought by CVS, they discontinued ordering anything from any of the vendors. That took my income away. Before I got behind on any bills, I called lenders and told them, ‘I’m going to have a problem. Is there something we can do to prevent that from happening? Can you give me maybe two or three months?’ They said no. It was frustrating and scary. I worked so hard to get this house, and then for this to happen. I don’t like asking for help. I just wanted the bank to work with me. But no. I got three months behind on my mortgage and didn’t know what else to do so I went to Catholic Charities. They took a special interest, I think, because of my son. I was behind by more than $5,000 and they totally caught me up. I would have lost my house otherwise. “My husband and I had been renting our house for 14 months, beginning in June, 2008, when we received a notice that the house was going up for auction. We went to the rental agency that was managing the house and asked what was going on. They said ‘don’t worry about it; the guy’s just refinancing and they have to send these notices out.’ On August 13th, 2009 we came home to a note on the door saying the house had been sold at a foreclosure auction and we had three days if we were the owners and ninety days if we were renters to vacate the property. I called the name on the note and told him we’re renters, not owners. I also told him we’d like to continue to rent the house. He says ‘No. This is what we do. 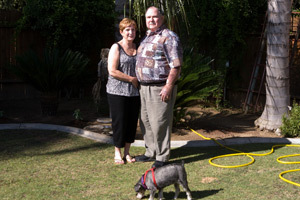 We buy foreclosed houses and we sell them.’ I said ‘ok, we’ll be out in 90 days. '” “A week after the house was sold, the guy starts calling me. He’s a real estate agent in town working for the company that bought the house. ‘When you gonna let us into the house? We need to take pictures for insurance purposes.’ Just constantly bugging me. Finally, I looked up renter’s rights and told him I didn’t want him in the house. That’s when he started showing up at the door, telling me he’s going to bring a locksmith and change the locks. This was within the 90 days. I’d been doing more research on our rights and I say, ‘You got a court order?’ He says he doesn’t need one. I say, ‘Yes, you do. Look up California tenant law. You can’t change the lock and you can’t have access to my house.’ My husband is at work and I’m alone with my kids but I’m a tough old gal.” Citing a “pattern of illegal conduct” and tenant harassment, more than 20 housing rights and public interest groups from across California petitioned then-Attorney General Jerry Brown to take action against agents like the one Teriann Selby described. At least 37 percent of homes in foreclosure in California are rentals. Last year alone, more than 200,000 California renters were affected by foreclosures, and most of them were displaced. California law now requires that banks and other post-foreclosure owners inform tenants of their rights and advise them to seek legal help.